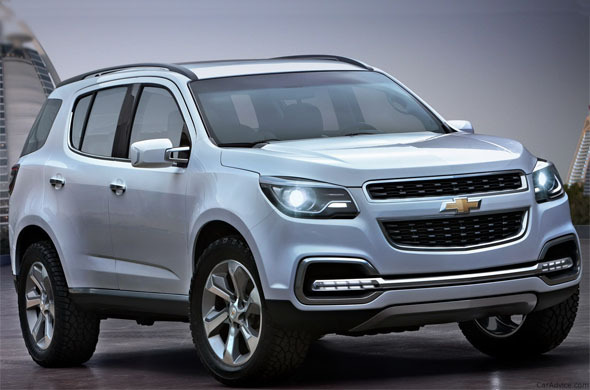 Chevrolet may launch the Trailblazer SUV in India! General Motors (GM) India may launch a new SUV called the ‘Trailblazer’ to compete with the Toyota Fortuner and the Ford Endeavour. The Trailblazer concept was showcased at the 2011 Dubai Auto Show back in November 2011. Based on the Chevrolet Colorado pickup truck, the Trailblazer will first hit the Thailand market and may then be introduced to India. 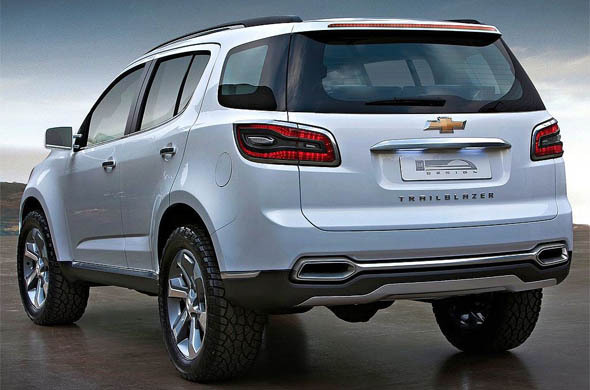 The Trailblazer concept is a proper seven-seater SUV. It has simple yet captivating looks. The typical bowtie family grille dominates the front. The large dual projector headlamps and unique shaped daytime running LED fog lamps integrated in to the front bumper render a sporty look to the SUV. The side profile looks butch too with the 20 inch aluminum wheels, flared wheel arches and chrome coated pull type door handles. The rear of the Trailblazer has attractive LED tail lamps with chrome surrounds and a wide tailgate with the ‘Trailblazer’ badge below the number plate section. The interiors of the Trailblazer concept show three rows of seats. The front and middle row seats have central armrests. The third row seems to have just enough legroom for kids. Expect the production version to have different set of seats and interior color combination. The Trailblazer will likely be powered by a 2.8-litre, Duramax turbo diesel motor that puts out 180 bhp of power and 468.7 Nm of torque. When compared with the Toyota Fortuner’s engine and the Ford Endeavour’s engine, the upcoming Trailblazer’s engine is more powerful and also has more torque. Though a proper road test will let us know whether Trailblazer can outperform the Fortuner and Endeavour, the engine specifications however are in favour of Trailblazer. 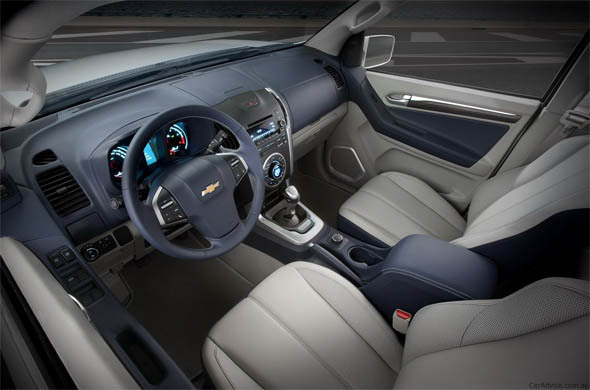 The Trailblazer is expected to come with features such as dual-zone AC, digital climate control system, and infotainment technology with options such as touch screen, GPS navigation, DVD drive, Bluetooth support, USB and Aux-in ports. The Trailblazer may enter India via the Completely Knocked Down (CKD) route with parts being imported from Thailand. Assembling the Trailblazer locally will help GM India price it competitively. We expect the Trailblazer to be priced in the range of Rs. 18 lakh – 21 lakh. 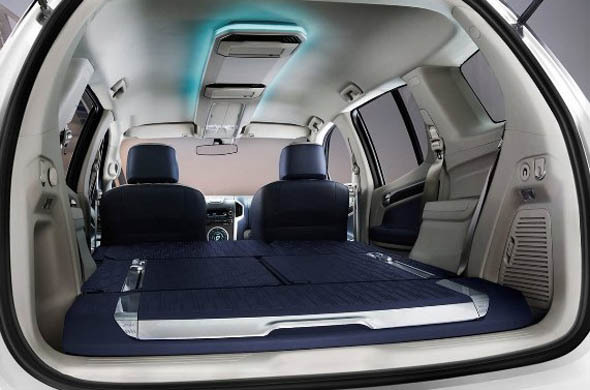 Demand for the entry-level premium SUVs such as the Toyota Fortuner is quite high and the Chevrolet Trailblazer is sure to stir this segment. However, it will be challenging for GM India to market the Captiva and the Trailblazer side by side, since both the SUVs will likely be pitched in the same segment with almost similar pricing. « Skoda to bring back ‘Octavia’ brand name to India!